Do you hard to understand the Cost of Goods Sold flow and its calculation? Not only you, many times we are not given a simple and easy way on how to calculate Cost of Goods Sold right away. Try this way, it may easier as I found it so. Direct Material Beginning Balance: On the beginning of a book, you will have beginning balance of “Direct Material Beginning Balance”, it is on the Balance Sheet. If you have not constructed an opening balance sheet, you can find the number on the balance sheet of the previous book. Put this on the top of the section. Direct Material Purchase: This is value of all direct material purchased during the current book period. Note: Don’t forget to include the inbound freight, purchase return and discount in it. Direct Material Ending Balance: This is value of the direct material ending balance after it is used for making the product during the book period. Direct Material Usage: This number comes from part-1 (see the above chart). Direct Labor Cost: This is the total wages (paycheck) for employees who involved in the process of making the product. They are usually paid by unit product or hours. Manufacturing Overhead: This is total cost incurred to make the product other than the Direct Material and Direct Labor (i.e. : Depreciation of Machineries, Factory Maintenance, Electricity used in the Production, etc.). Total Product Cost: This number comes from Part-2. Work In Process (WIP) Beginning Balance: You can get this number from balance sheet of previous book. Wok In process (WIP) Ending Balance: This is value of the work in process ending balance after it is used for making the product during the book period. Cost of Goods Manufactured: This number comes from Part-3. Finished Goods Beginning Balance: You can get this number from balance sheet of previous book. Finished Goods Ending Balance: This is value of finished goods ending balance after it is sold. Have a look the chart for calculation. 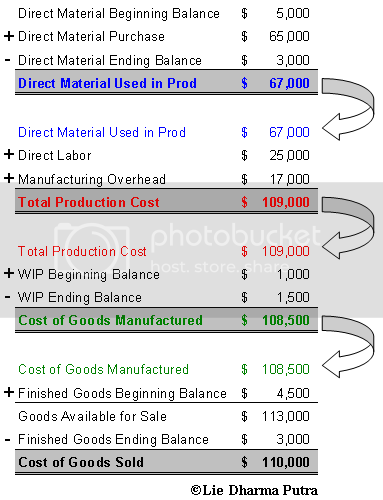 I hope you find it is useful, and gives an easier understanding on how to calculate cost of goods sold.